Krakow - Another major tournament, and another major disappointment for Wayne Rooney. The man regarded as the most gifted English footballer of his generation is running out of opportunities to prove that his dazzling debut at Euro 2004 was anything more than a teenage flash in the pan. Suspended for the first two matches of England's Euro 2012 campaign, Rooney made a goalscoring return in the 1-0 victory against Ukraine, a win which helped his side finish top of Group D.
Although the Manchester United striker looked some distance off his best form, England's management remained optimistic that Rooney would turn in an improved showing in the quarter-finals against Italy. However that optimism proved to be ill-founded on Sunday as the 26-year-old failed once again to stamp his authority on a major tournament after disappointments at the 2006 and 2010 World Cups. Looking alarmingly short of match fitness, Rooney was also guilty of ceding possession all too frequently -- completing just 27 of 50 passes attempted, a completion rate of 54 percent. Only James Milner, with 48 percent, was lower. Rooney's disappointing performances means that he will have to wait another two years until the 2014 World Cup in Brazil before he has another chance to prove he deserves to be bracketed with the world's best footballers. 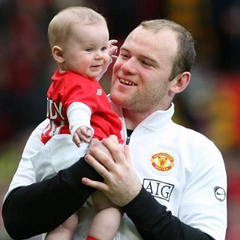 Rooney's displays have focused attention on his physical conditioning. His decision to take a pre-tournament holiday in Las Vegas, where he was photographed visiting the gaming tables and nightclubs of Sin City, looks even more ill-advised. However England manager Roy Hodgson has insisted his coaching staff were happy with the striker's fitness when he joined up with the squad last month. "We've monitored his fitness levels and in training he has looked very fit," Hodgson said Monday shortly before England left their Krakow base. "In the first game he didn't show any particular signs of lacking any fitness and he played the 120 minutes (on Sunday). "I think what you might be saying is that you're a bit disappointed with his performance and maybe thought he could have played better." It is hard to argue however that Rooney has looked as lean at Euro 2012 as he did in his scintillating 2009/2010 season, as comparison of images of the two periods reveals. Nevertheless Hodgson defended the fitness of his striker. "You could put fitness down to anything. That was the classic Italian trick. Every time an Italian team loses a game, you hear they're not fit," he said. "You can put a lot of things down to fitness, but there was no reason for us to doubt his fitness. His running stats in the training sessions and the games were actually very good." Hodgson conceded however that Rooney may have struggled to meet the high expectations set by the management. "I think we put a lot of expectations on him," he said. "When he missed the first two games we were all believing that what we need to do now get to the third game and Wayne Rooney will win us the championships. "That maybe was too much to ask of him. He certainly tried very hard, but he didn't have his best game. I think he would admit that. "That might be down to a number of factors, but I don't think that fitness itself was a particular factor."